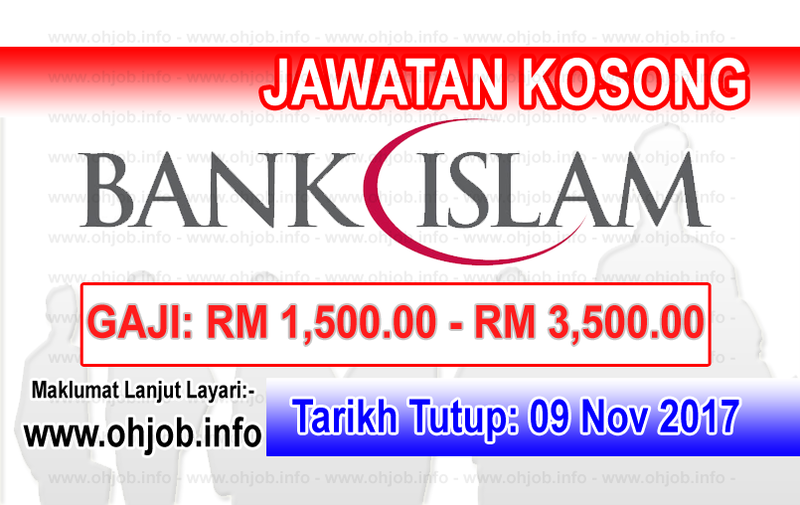 Bank Islam Malaysia Berhad is the pioneer of Islamic banking system in Malaysia. We have grown to become one of the nation’s leading financial institutions, providing a wide range of products and services to meet the financial and banking needs of all Malaysians, regardless of race and religion. A career with Bank Islam means an outstanding opportunity to develop a professional vocation in the ever-challenging banking industry. Be a part of an organisation that is totally committed to developing Malaysia as one of the leading global Islamic financial centres. Terima Kasih Kerana Membaca Dan Menyemak Jawatan Kosong Bank Islam Malaysia Berhad (09 November 2017) Selamat Memohon Dan Semoga Berjaya Kami Ucapkan, Sila LIKE Facebook Page Kami Dan Kongsikan Kepada Semua.